More piglets born today! 2nd litter this week from our heritage breed Large Black hogs. Our elder stateswoman “Shirley” had a handsome litter of 6 piglets out on pasture, so now they join the litter from earlier this week running around our fall pastures and woodlots. 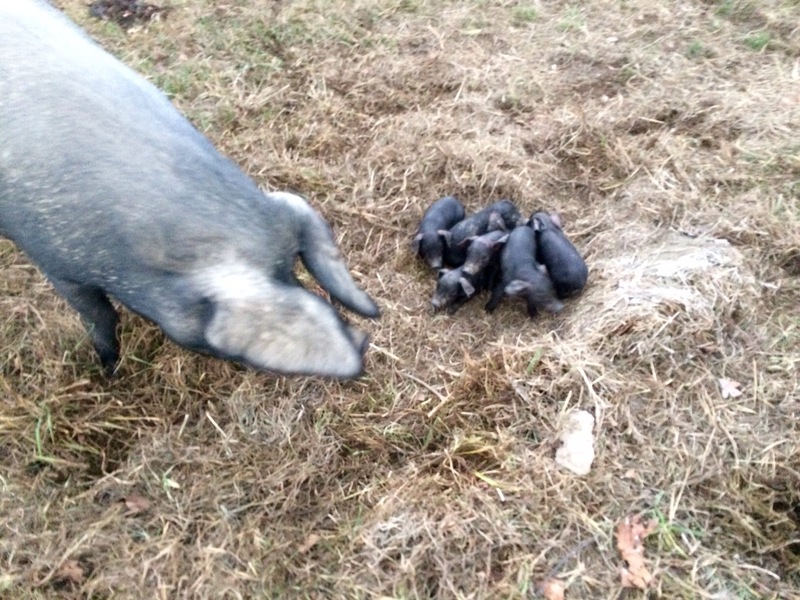 A Large Black hog sow guards her new litter. Shirley is an attentive mother who lets you inspect the piglets just as long as nobody squeals. Then she gets protective. These best 2 or 3 piglets combined from these litters may be sold as breeding stock to other farmers like us. The rest will grow out on our farm for the next year, fattening on fall hickories, acorns, and walnuts before gracing some lucky family’s table. An older group of pigs will be ready to go in the late spring of 2016. Contact us to try your first pastured pork.